Nuclear Weapons gain their value from the social system they are created into. Therefore, their value is subject to change based on how society decides to perceive these weapons. In the recent U.S. Nuclear Posture Review, the Trump Administrations reverses years of nuclear nonproliferation policy and calls for a modernized, more deadly, U.S. nuclear arsenal–including “small” nuclear weapons for use in conventional warfare. The U.S. Nuclear Posture Review suggests that we should prepare for a small-scale nuclear war. It treats nuclear weapons as normal, not as means of genocide and omnicide and the possible extermination of humankind. The Administration’s rhetoric regarding nuclear weapons, as articulated in the NPR, could create a new, more deadly, arms race. Nuclear weapons are “social objects” that gain their value from the social context we create, therefore the value attached to them is subject to change. Nuclear abolition movements must include the devaluation of nuclear weapons if political elites are to be expected to voluntarily rid themselves of them. To devalue nuclear weapons we must shift to de-nuclearized conceptions of national identity and security, decrease the power and prestige associated with their possession, and challenge arguments about the effectiveness of nuclear deterrence. “Us Nuclear Posture Review Gives Strong Arguments For A Prohibition Of All Nuclear Weapons”. By Gunnar Westberg For International Physicians For The Prevention Of Nuclear War. Feb. 13, 2018. 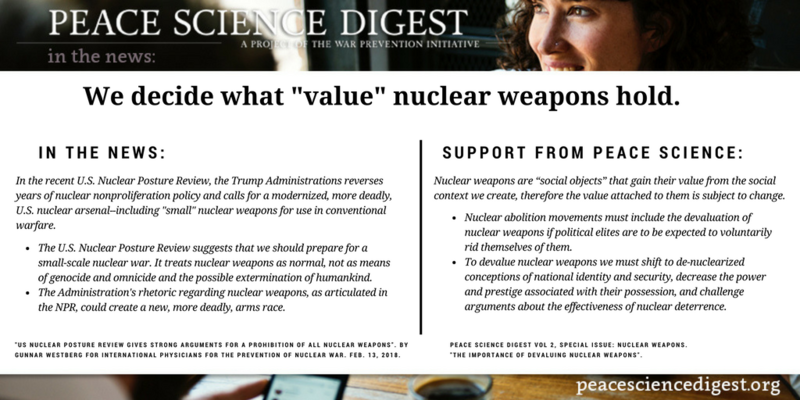 Peace Science Digest Vol 2, Special Issue: Nuclear Weapons. “The Importance Of Devaluing Nuclear Weapons“. Previous article Undiscussed Terrorism: Victims of the U.S. Alt-Right.